Warcraft: Source (WCS) is a modification that has been around for a very long time, from the early days of EventScripts with version up to WCS 0.77 (by Kryptonite), an Orange-Box compatible version 0.78 (by me), a Source.Python-compatible version built on top of mine (updated by Kami), and the other versions that let go of the console-based system, and chose a pure Python approach such as: EventScripts Python version WCS:Python by Jeff91 and Freddukes, and Source.Python version Hero-Wars by Mahi, Kamiqawa, and Predz. My apologies if I've forgotten any. This may very well be yet another one to add to this list, so what's the difference? Well, this is a first where EventScripts (0.77 and earlier or 0.78) races and items and Python races and items (using EventScripts Python or Source.Python) will work together, with no difference other than how they're written. This allows you, the server owner, to choose from a wide array of races and items, and with the ability to install races and items directly on the server makes it easier than ever to install, update, and uninstall them. A lot of other information. You install it like any other Source.Python plugin but I've added a small guide here, and a bit more information to get you started. 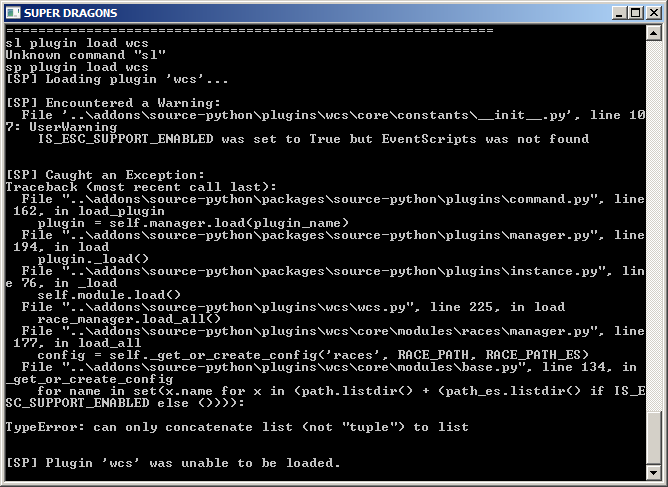 Races and items that uses EventScripts commands or functions requires Ayuto's EventScripts Emulator. If you are using races or items from 0.77 and earlier or 0.78, you have to load all separate files, that are required, manually. There are currently a limited number of races and items available on the repository. Feel free to do a pull request on the repository with your races or items. I appreciate any and all feedback on how to improve it (as long as it's constructive criticism), so feel free to come with some. That's about all I have, so without making a super long post (and because I'm awful at this stuff), thanks for reading. Looking at this version of the modification it seems very, very promising as it allows people to use their own prefered style of coding whether it'd be pure source python, ESP or ES:S. This alone makes it a very great choice if you wish to start playing around with the warcraft source modification but have a certain language preferance without wanting to make a compromise. This modification can also run all the races made for ALL the previous versions of the modification, which is amazing. Not only because this version is the only one providing you with this option, but also because it means a lot of the "old but gold" races and content will not go to waste and will be possible to use once again, so those who have their old server files lying around could essentially reopen their servers without too much effort. Awesome! I think WCS was the gamemode I played the most in CS:S, can't wait to play around with this. Very nice! I'll have to test this one out for sure. Hello!! i try to load the wcs on my server just following all the steps, but when i try to load wcs i got an error. can u help me please? Thanks for the positive feedback! I hope you'll have a good time with it. bolarke wrote: Hello!! i try to load the wcs on my server just following all the steps, but when i try to load wcs i got an error. can u help me please? Thanks for reporting. That should be fixed in the new version. TPDerp wrote: Thanks for the positive feedback! I hope you'll have a good time with it. There's no included races, so that's why you aren't seeing any races. You have to add your own races. That looks perfect. Have you made sure that it's your steamid? You open the admin menu by typing "wcsadmin" in the chat, just to make sure you're typing the correct command. TPDerp wrote: There's no included races, so that's why you aren't seeing any races. You have to add your own races. so, how do i add races?? i copy the 4 races that comes on the guide on the folders, but it does not work. is it necesary to edit some config file? the part of the admin, thats my steam id and when i type wcsadmin the server tolds me that i have no acces, so maybe i have to use other steamid format? bolarke wrote: so, how do i add races?? i copy the 4 races that comes on the guide on the folders, but it does not work. is it necesary to edit some config file? I've updated the readme with information on how to add races and items. You can visit Warcraft-Source.com for a wide varity of races and items. You sure ? I mean, did you use both mods one-by-one in the same Server and thus the same game ? If you did, that's a surprising diff. Wow mate love the new readme. I cant load races from github becouse of pip. i will work on it, but will too try to add manually races, thx for the update! anyway i will reinstall a clean server to see if it happends again. glad to see some active developement in the wcs community, will use this! para97 wrote: glad to see some active developement in the wcs community, will use this! para97 wrote: do the ultimates work? Yes, they should. Are you experiencing otherwise? Yes, somehow I cannot figure out to get them work. Installed on a fresh SP only server. para97 wrote: Yes, somehow I cannot figure out to get them work. Installed on a fresh SP only server. Is it a specific race that's not working or is it all? To use an ultimate, you use "ultimate" in your console or bind it to a specific key (bind <key> ultimate). To see if it's an ultimate, ability, or +ability, you can type "raceinfo" in-game -> choosing the race -> "Skills" and see it there's a "(ultimate)", "(ability)", or "(+ability)" as a suffix.